spectrum pulse: album review: 'you're not alone' by andrew w.k. I remember when saying you liked Andrew W.K. as a critic was a much more polarizing statement than it is today. And let's not mince words: when I Get Wet first came out, there was a vast gulf between the critics that adored it and those that hated it with a passion. And a lot of that was a factor of the time: it was late 2001, hard rock was making a hard pivot to the dark and serious, and here comes an artist with the simplest of lyrics, the most obviously overblown sound and production, all driven by strident piano compositions that seemed deceptively simple. For a set of cynical critics coming out of the 90s, it had to be a corporate calculation gone wrong, or a parody years out of date, all of it so damn stupid that nobody in their right mind could ever take this seriously! In retrospect, time has been way kinder to Andrew W.K. and I Get Wet specifically because of the gradual revelation that it wasn't a gimmick. Yeah, it was broad and goofy and ridiculous, but there was a method to that deceptive simplicity that cut across critical faculties into something damn near transcendent, rooted in sharp melodic songwriting and the real earnestness and optimism that Andrew W.K. brought to the table. Sure, it was a little one-note in terms of content - although the sound would eventually dive towards mainstream rock before going for outright piano rock on later records - but like with Lil Jon in hip-hop, as a collective society we've decided to keep Andrew W.K. around, if only because that good-hearted earnestness is only a net positive, be it on the multiple J-pop cover records or his motivational speaking tours! That said, when Andrew W.K. announced his first full-length record in nine years, I won't deny that I was skeptical, mostly because I Get Wet still looms above so much of his musical career, and even if he had found a way to remake that party magic seventeen years later, the album was still going to run fifty-two minutes and sixteen tracks - you can only hit one note so many times. But hell, I wanted a good time, so how is You're Not Alone? Okay, if I'm being very honest, I should probably put this record on the Trailing Edge and walk away, because there really isn't much that needs to be said about it, and my opinion on it crystallized probably faster than any record I've covered in the past few months. But at the end of the day, I have to do this review to reinforce the unfortunate reality that comes as a critic: sometimes there's an artist you might really love as a personality, but the projects they put out just don't stick the landing, especially when it becomes incredibly easy to point to an act that has a very similar sound and who is doing it better. And here's the thing: I like over-the-top cheesy hard rock and power metal, and even when you can tell you don't need to take it seriously, I at least put in the effort. And thus I was prepared to excuse the broadly-sketched lyrics, the gated drums, the compressed guitars driving a groove off the gleaming keyboards, even the spoken word segments where you can tell that Andrew W.K. was pulling from his speaking tours to flesh out his 'philosophy of partying'. And you can tell he was working his damnedest to ensure the verisimilitude of that setting and state of mind - but here's the rub: he's not the only artist in this vein anymore fusing broad pop melodies with hard rock or metal. There's still not a lot of it - it's a genre fusion that many can't take seriously - but I also can't deny that the first thoughts that went through my head upon listening to You're Not Alone is that the Devin Townsend Project was doing this sound with far better production, melodies, and songwriting on Epicloud six years ago. And as much as I like Andrew W.K. and am happy to see him back in this lane, when the artistic comparison becomes so immediate and obvious in terms of the polished tones and melodic focus, you can't help but realize that he hasn't really evolved as an artist to bypass very real shortcomings. Oh, you can tell he's trying - this record does take diversions into more symphonic territory and even has songs where the synths are a much greater presence than the guitars - but for as much as he hammers on those keys, the hooks are just not as catchy or electric, sometimes an issue of tempo but more often just not as sharp or developed. And while I get that complaining about production on an Andrew W.K. record is kind of pointless - it's not like I Get Wet was especially dynamic or well-produced - but even putting aside comparisons to Devin Townsend, his production has real problems, less issues of over-polish and more outright mistakes. It doesn't help your mix sound epic or big when your synth texture or guitar distortion is clipping the edges of your mix, especially when it all sounds so clean already - that doesn't sound over-the-top or huge, it sounds like your guitar pickup and vocals aren't micced or mixed properly. Now that's not saying there aren't songs that click with me - 'I Don't Know Anything', 'The Party Never Dies', and 'Keep On Going' have the feel of vintage Andrew W.K., and the synth-heavy power ballads 'Total Freedom' and 'Give Up On You' are goofy fun... but now we have to get to the content. And look, the one factor when it comes to this brand of over-the-top songwriting is that it doesn't slip towards clumsiness or just embarrassing turns of phrase... and there's unfortunately a lot of both on this record on songs like 'Party Mindset', which just feels slapdash in its rhyme structure and cadence. 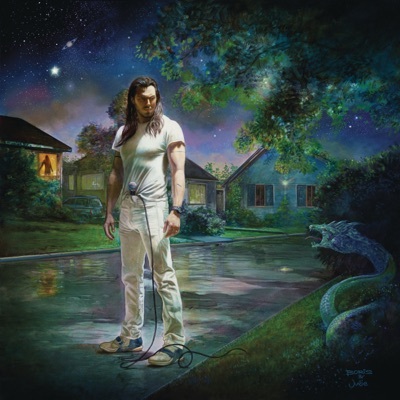 More to the point, when this record does slip towards one-dimensional head bangers, you run into the issue of telling them apart, and to Andrew W.K. 's credit, he tries to switch things up and space out the more mindless tracks. And further to that point, the core themes of self-acceptance and yet being able to give into the wild oblivion of a reckless party... I wouldn't structure a whole philosophical movement around it, but Andrew W.K. 's natural sincerity helps to sell it... until you start thinking about it. And I know I shouldn't be, but there's something a little bleak and nihilistic about succumbing to the mindless party because you can't change your inhibitions. And don't get me started on the mentions of God and the Devil on this record - I'm inclined to just say it doesn't make much or any sense and just move on, but when you have an entire song called 'The Devil Is On Your Side' highlighting how your vices are always with you... it's a weird juxtaposition to place opposite any mention of a higher power, but when you couple it with the spoken word interludes, it does put me in the mind of certain Christian rock that doesn't really engage all that deeply with the philosophies it espouses. And while Andrew W.K. has the ability to sidestep those questions given his tone and content, the fact that the broadly sketched lyrics will raise those questions multiple times on a record that runs nearly an hour... look, I can make a lot of excuses, but that certainly pushes it. But look, at the end of the day, I'm reminded of reviews of I Get Wet that said it would have been perfect if it was only just the most transcendent, blisteringly simple moments, and when this record gets close to that, it's a lot of fun. The problem is that the experimentation and extended digressions don't enhance or add to that formula, they just add padding and questions and sloppy production that only serves to mute the power of the finished product, and when you now have comparison points in the genre, it's less excusable. Don't get me wrong, I really do like Andrew W.K. as a pop culture phenomenon and I'm happy he found his lane and cult following, who'll likely eat up this project. But for me... look, the production issues really did this in for me, it's a 6/10. If you're a diehard fan, this is easy to pick up and enjoy - a little too long, but there's enough agreeable personality for the ride. Otherwise... check out I Get Wet first, and then go into the party from there - you'll probably have a really good time.